I have a gut feeling that this review will end up being more controversial than it should be. Hell, the last time I covered Bastille it ended up controversial, mostly because while I didn't mind the record I also felt a little distant from it. Keep in mind this is a group that had a song that landed on my top ten best hit songs of 2014 and a record on which I was positive... but not one that I felt held up outside of a few songs. Part of it was the somewhat awkward blend of textures that came through matching colder, stiffer electronic beats and percussion with more organic vocal textures, and then when you factor in lyrics that occasionally aimed for higher concepts and yet rarely stuck the landing when they weren't wallowing in relationship drama that didn't match the bombast... it felt like an odd blend that didn't quite connect. But to be fair, Bastille's always been a weird mishmash of an act - probably closest to the percussion-over-melody brand of indie pop rock that can be very hit-and-miss with me, and yet they did have a distinctive style and attitude that I wished I could like more. And that's one reason I was willing to give their follow-up record Wild World a chance - same production team, a little more experience and polish and knowledge of a workable sound, maybe it would lead to stronger songs. Was I right? 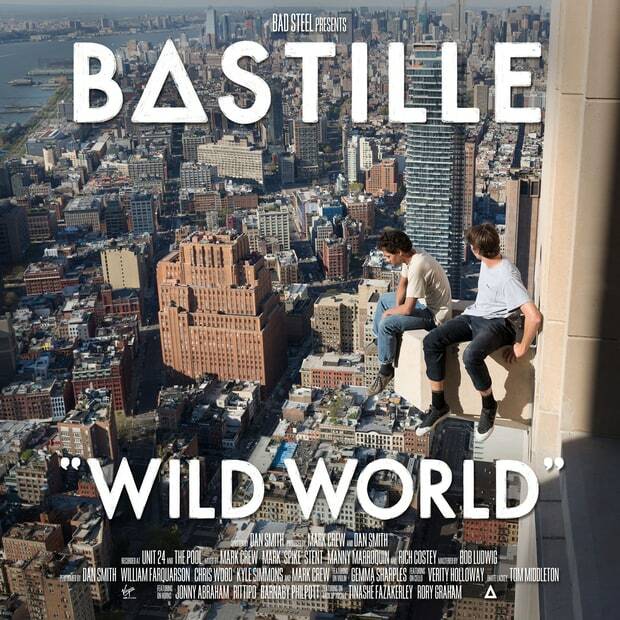 Nope - if anything, Wild World is the record that actually had me questioning my rationale for liking Bastille in the first place, which is never the reaction you want. Because while I might get Bastille's superficial appeal, the more I dug into this record the more I found lingering issues in production and songwriting across the board that really got on my nerves. And what's all the more disconcerting is that these are problems that have been lingering since their debut, just obscured by songwriting that felt stronger or a more cohesive sound - because you sure as hell don't get the latter here! And here's the thing: on the surface many of the individual elements that factor into a Bastille album could work. Dan Smith is rarely a visceral singer, but his earnest tones and multi-tracking could lead to real power if given instrumentation that had enough warmth or dramatic swell to cushion it. There's certainly more guitar on this record, either the sparse plucked tones on 'Power' or the smoky stab at a torch song on 'Two Evils' or the blocky riffs that characterize tracks like 'The Currents', 'Lethargy', and especially 'Blame', which runs away as the best song on this record for actually being able to convert these elements into a song with an edge, mostly courtesy of one of the many nervy basslines that Bastille actually manages to make work. And hell, I could even get on board with the sizzle of the strings on 'The Currents' or the horns on 'Send Them Off!' - didn't like any of the compression but at least it felt like an interesting instrumental idea. But just like with 'Bad Blood', the problem comes in putting the pieces together, with the first facet being that nobody seems to have a clue what to do with the percussion. Sometimes we get real drums that can build some propulsive momentum, but more often than not we get drum machines that are either smothered in dampening filters and effects or are such poor fidelity that they don't match with the rest of the mix at all. Of course, the overload of effects is a problem across the board, and shows a lot of real problems with the mixing - instead of letting instruments breathe normally or build to natural swell, they're compressed and contorted into blocks that are haphazardly stacked, hoping there's enough reverb and filters to blur it all together. And not only does this lead to a starkly monochromatic mix lacking in natural texture, it also falls right into the trap of over-emphasizing compressed percussion over the melodies, which does a complete disservice to these hooks! And given this was also symptomatic of the mixing on Bad Blood - which was handled by Mark Crew and the band itself - I think I need to explain why this doesn't work, or perhaps gives off the wrong impression. One of Bastille's greatest strengths in Dan Smith - when he's not doing his falsetto - is his earnestness. Not as stiff as Sam Smith can be, but he's got organic presence - and yet when you pair him with instrumentation that's not only cold but can only build to a natural crescendo through bad EQing and post-production, you're not flattering his vocal tones. Granted, there's a part of me that thinks they might grasp this and just don't care, evidenced by 'An Act Of Kindness' where Smith tries for an binaural vocal pickup - left ear, right ear, then blended together in the middle - but the clash in fidelity feels more sloppy than anything else. It doesn't help that any stab at mix depth feels completely forced, between abusing reverb or the bass on 'Fake It' that completely swamps out the song, and factoring in the overcompression all over the place which renders tones like the shrillness on 'Warmth' and 'Snakes', it sounds like the band has completely misunderstood their strengths. Yes, I get that they were inspired by the clashing tones that Kanye has used and were going for more of a mixtape feel with the vocal samples - there's an art to dramatic contrast and defining edges that Bastille aren't close to mastering, mostly because I get the impression they chickened out on really letting any raw tones actually clash. Granted, if we were looking for a lyrical theme on this record, 'chickening out' would be the apt term, as Dan Smith's lyrics might be the biggest exercise in arrested development I've heard since Green Day's Dos!. And let me start by saying that yes, I totally get that Dan Smith is well aware that his refusal to take any responsibility is not a good thing, instead trying to comment on humanity's tendency to bury one's head in the sand than acknowledge the truth. But just because I understand the thematic arc doesn't mean I don't find it insufferable or poorly executed, mostly because just like on Bad Blood these sorts of half measures are a terrible fit for Dan Smith's vocal delivery, which doesn't have the subtlety or edge or pull it off. And that's before we get into the framing of these situations, like on 'Warmth', where instead of actually dealing with the world he runs to the comfort of a lover and prefers to ignore it - and yet the upbeat delivery makes it clear we're supposed to be on his side in willful denial. That same disconnected framing crops up again and again on this record, between 'Lethargy' and its bizarre string of Bowie references that barely connect, to the opener 'Good Grief' that doesn't come close to capturing the complex emotions that come when trying to put on that happy face, to 'Snakes' which turns the subtext into text in the most thuddingly obvious way possible. And here's the problem with taking this thematic arc: not only does it render well-meaning political statements like 'The Currents' and 'Four Walls' against misleading propaganda and the death penalty as half-hearted at best, it makes his relationship songs even more obnoxious than usual. At its least offensive you get 'Power', which sounded a lot better when it was called 'Fire Away' by Chris Stapleton and at least implied mental instability, but then you have 'Send Em Off', where he calls upon the girl to exorcise his jealousy out and evokes Desdemona from Othello - you know, the woman that Othello strangled in a jealous rage in that play that plays the impetus for quelling jealousy on an innocent and that shows while Dan Smith will reference Shakespeare, he clearly doesn't get it. And it gets worse: I could talk about 'Fake It' and how instead of actually dealing with the roots of relationship problems he's just prepared to ignore all of it, but the real ugly track is 'Two Evils', where he's in competition with another guy for a girl's heart and says, 'as the lesser of two evils, it pays to be the nice guy sometimes' - seriously, dude? Between the condescension-disguised-as-earnestness there, or 'Glory' where there's no point in aspiring to the impossible, or 'An Act Of Kindness' where he's rendered shaken and guilty by the mere act, this record reads easily one of the most cynical and nihilistic pieces I've heard in a while... but it's not framed like that. At least ANOHNI seemed to grasp that her hopelessness was reckless and toxic even if her delivery didn't - not only does Dan Smith delivery not reflect his writing, the nihilism screams of immaturity and convenience, which gets insufferable really fast. In other words, the more I think through this record the less I like it, so why isn't it getting an even lower score? Well, to give them some credit there are a few decent melodies and grooves if you can get through the production, and 'Blame' is a legitimately solid track, if only because the lyrics try to have a real edge - even if Dan Smith's attempt to convey it vocally is hysterical. But yeah, this record soured on me fast and the more I think about it the more I wonder what the hell happened here. For me, it's a 4/10 and the only people to whom I could recommend this are the fans, but folks, there are indie rock acts this year who deliver more depth, stronger grooves, and better production than this borderline silent majority act. Check out Parquet Courts, Car Seat Headrest, or even that last Young The Giant album that was better than expected, whereas this was a real disappointment.